In a medium bowl, add the pears, both sugars, cornstarch, both spices, sea salt, orange juice, and vanilla. Mix everything together until combined. Remove one sheet of puff pastry from the refrigerator, and on a lightly floured surface roll into a 10” x 10” square. Use either a sharp knife or pizza cutter to cut the dough into 4 equal sized squares. Place about 2 heaped tablespoons in the the center of each square. Using either a moistened finger, or a pastry brush dipped in water, wet the edges of each square with a small amount of water. Carefully fold each square over to form a triangle. Once folded, use your finger to press the edges together. Use the back of a fork to crimp the edges of the turnover. Carefully place the turnovers on a tray lined with parchment paper and place in the refrigerator to chill for at least 30 minutes. Repeat this process once more time for the second sheet of puff pastry. Turn the oven on and select its bake setting and preheat it to 375°F. Remove 2-3 turnovers from the fridge and place on the Wolf Gourmet baking pan that’s been lined with parchment paper. 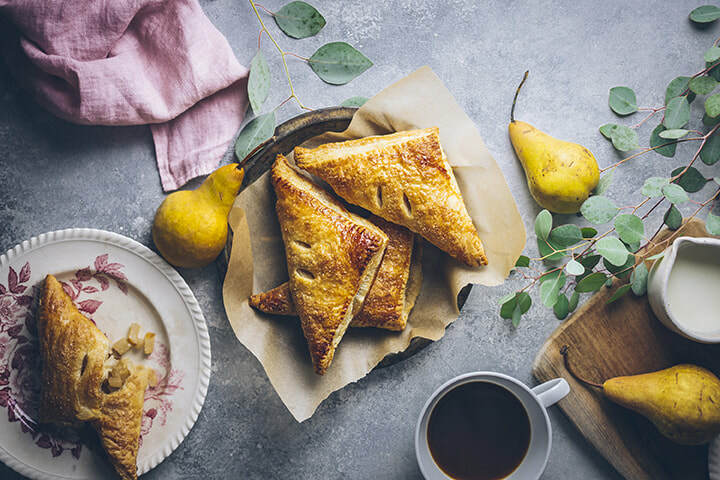 Cut 2 small slits into each turnover, and brush each one with the egg wash. Sprinkle each turnover with a bit of granulated sugar and place in the oven. Bake for 20-25 minutes, or until browned and puffed. Remove from oven and let cool on a cooling rack for around 5-10 minutes. Enjoy warm, or at room temperature. Follow this process to bake the remaining turnovers, or freeze them and save for another time. To save for another time, simply freeze the turnovers on a tray, then transfer to a ziplock bag. Before baking, brush with egg wash, and sprinkle with sugar. Bake at the same temperature, although the baking time will take about 5-10 minutes longer.